John Gardner and Betsy Barefoot know students, and they know the unique challenges that today's students face. As they discuss in the video above, their new edition of Step by Step to College and Career Success is particularly poised to help students overcome those challenges. 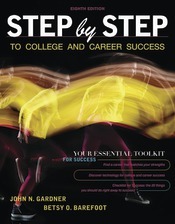 The briefest title in the Gardner family of books, this edition is user-friendly, streamlined, class-tested, and authoritatively researched; John and Betsy have focused on the most crucial skills and the most important choices students make in order to succeed in college and beyond. The eighth edition focuses more on technology--both on how students and instructors use technology currently, and how they could further use it to achieve educational and career goals, while providing tips on achieving those goals. Chapter content incorporates coverage of technological tools and skills, digital examples and models, and learning, along with more in-text examples that incorporate social media and apps, in an effort to reflect the role of these tools in students' lives. New TechTips help students leverage technology for their success, featuring timely subject matter such as identifying fake news, networking, and using digital tools to manage your time. Available for the first time with the eighth edition, LaunchPad Solo for Step by Step is home to dozens of pre-built assignable and assessable digital resources designed to help students engage with key course concepts and prepare for class, including LearningCurve adaptive quizzing, video activities, self-assessments, case study quizzes, and links to further resources such as apps and podcasts. Easy-to-use and easy-to-assign modules based on essential college success topics prompt students to apply the strategies discussed in class and are easily adaptable to your own course material, such as readings, videos, quizzes, discussion groups, and more. Fully integrated with this LaunchPad Solo is ACES, which measures student strengths in twelve critical areas and prompts students to reflect on their habits, behaviors, attitudes, and skills. Norm-referenced reports indicate whether students are at a high, moderate, or low skill level in particular areas. ACES self-assessment guidance is now integrated into this edition through the “Review Your ACES Score” feature at the beginning of each chapter (replacing the “How Do You Measure Up?” quizzes). A new appendix on “Using the ACES Progress Report” shows students using LaunchPad Solo how they can check their progress at the end of the semester to see the areas where they’ve grown. With a fun and compelling approach, Step by Step addresses real-world topics of pressing concern to students through student stories, in-depth articles, and Try It! activities. Topics covered include learning, emotional intelligence, making choices, learning with a learning disability, finding and using campus resources, gender and sexuality, and the impacts of activist campaigns like the #MeToo movement. Overall, this book truly focuses on the needs, challenges, worries, and opportunities of today's students, and how each step they take towards developing their skills is another step towards success. Each step is an opportunity.